There were precious few fireworks, and even fewer goals, as Hassocks gained their first league point at Nyetimber Lane since 2014. A losing streak of 6 games against the Lions came to an end in a match which never really caught alight. 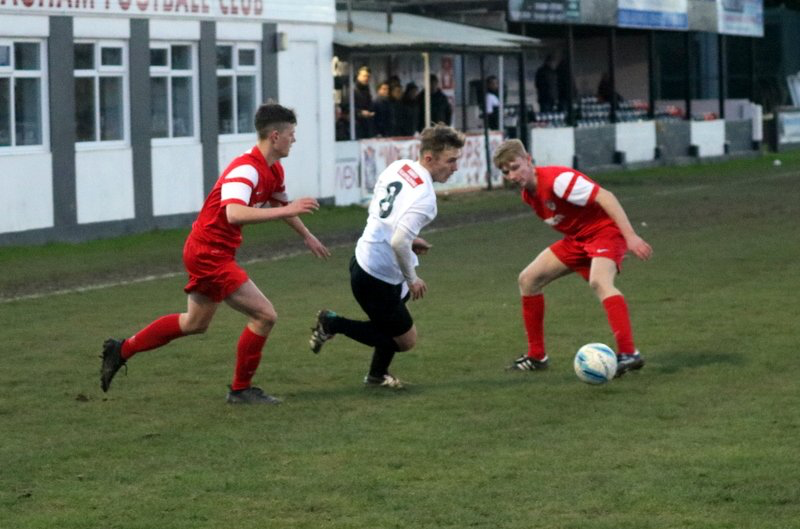 Dan Simmonds & Callum Overton lead the line for Pagham, and as early as the third minute, a free-kick frantically scrambled away for a corner. Joe Booker for the Lions had to be equally alert at the other end, the Robins flying forward on a quick break away. Joe Kilhams was causing problems for the visitors' defence, Tom Barnes especially being given a torrid time by Kilhams, and his own manager. Barnes was more than once a target for some less than encouraging encouragement from his own bench, and would by the end of the game look a less than happy man. Nathan Stroungberg was being kept busy in Hassocks' goal, with Dan Simmonds especially looking to add to his mid-week tally. Unfortunately for Strounberg, the same couldn't be said for his forwards, Charlie Pitcher containing his anger on 25 minutes, as his shot went well wide of the mark. Pagham stepped up the pressure, BIngham and Kilhams going close. A free-kick for Hassocks just after the half hour was wasted as a dreadful low shot from Westlake rebounded out. The follow up saw the ball balloon over the net and out of harm's way. Slight scare for Pagham as George Bingham went down under a challenge. One application of the magic sponge later and he was back up and running. By now the Lions were roaring forward at every opportunity, shots being charged down by the obdurate Robins' defence. The visitors did almost gift Pagham a goal shortly before half time, with a defensive mix-up almost putting Strounberg off his stride. Just time for a slightly unconvincing offside decision against the Lions & it was half time. The second half commenced with a searing run from Hassocks' Liam Benson, crossing the ball into Pitcher. James Binfield pulled off a superb block to stop what should have been the opening goal. Binfield again denied Pitcher a few minutes later with a reflex save. Shots over the bar from Simmonds and Overton showed the Lions' intent, but no goals. Simmonds was unlucky just on the hour mark with a header over following a goalmouth scramble. Hassocks' bench turned up the volume on their team cajoling and their critique of the officials' performance. None of this had any bearing on the flow of the game which became scrappy as the last 20 minutes approached. Off went George Bingham for Pagham, Andy Chick coming on to ruffle the Robins' feathers. Binfield was again the hero of the hour with Benson lurking, Pagham's keeper snatching the ball just in time. A ball into Mike Death for Hassocks almost caused a scare for Pagham, but his header ghosted wide. A Pagham corner was whipped into the area, only for more frantic defending as it was hacked off the line. Lloyd Rowlatt's midfield industry for Pagham came to an end on 83 minutes, as George Cody came on as sub. The Lions had the perfect chance to score on 87 minutes, Strounberg spilling a catch, only to recover just in time. With referee Mr Webb spinning out three minutes added time, Hassocks could have lost to a last gasp shot from Simmonds, only for Strounberg to come to their rescue.